Quick, think of your favourite ice-cream place. Who makes the ice-cream there? Chances are you listed a franchise - Trampoline, for instance - and probably don't know. Is this the new trend of ice-cream, faceless automatons churning out tub after tub, with no personal touch? Whether it is or not, it's good to know that there's still one man kicking it old-school in Albert Park. Jock's Ice Cream, on 83 Victoria Avenue, deserves to be called an artisan ice-creamery. The wood-and-gold shopfront proudly states that everything inside (presumably everything edible) is 'made by Jock'. The sign's talking about Jock Main, owner and operator of Jock's Ice Cream since its establishment around ten years ago. He's got a true story of hardship and redemption - injured by a motorcycle accident, he turned to making ice-cream to keep up his spirits - and the delicious results to show for it. With skills honed by over ten years of practice, Jock's Ice Cream is known for pushing the boundaries of acceptable ice-cream flavours. Forget prune or pistachio flavours - that's far too tame for Jock Main - and start thinking about sweetcorn or beetroot ice-cream. In the aftermath of Obama's election victory, Jock Main produced an 'Obamarama' ice-cream with a quintessentially American taste: peanut butter and jelly (that's jam, to us Australians). Don't worry, though, since the jam taste is stronger than the peanut. Despite adventures into weird flavours, Jock's Ice Cream tastes comfortingly delicious. The hotter it is outside, the more appealing this gets. If you're a bit of a vanilla personality, Jock's Ice Cream also produces 'normal' ice-cream. Old familiars like chocolate and hokey-pokey are popular as ever, and there's a whole range of fruit sorbets (all of which taste like actual fruit, not some chemical approximation.) Try the green apple sorbet for a wonderful experience - green apple is one of those flavours that very few places manage to get right, but Jock Main pulls it off well. Mandarin is another example of this. Stay away from boring flavours like lemon sorbet, if you can - they're nice, of course, but not substantially nicer than the lemon sorbet you can get elsewhere. Unless you're lucky enough to live nearby, you're better off sticking to the more interesting options. Many Melbourne locals rank Jock's Ice Cream as the best ice-cream place in the city. This is high praise: Melbourne's contingent of black-wearing, skinny-jeaned hipsters do not handle summer temperatures very well without ice cream, and many shops have sprung up to meet the need. Tourists in the know tend to flock here, after visiting the nearby (and just as famous) Andrew's Hamburgers. There's nothing quite like a refreshing sorbet after a salty steak sandwich. Overall, should you visit Jock's Ice Cream? Yes, absolutely, if you're in the area. 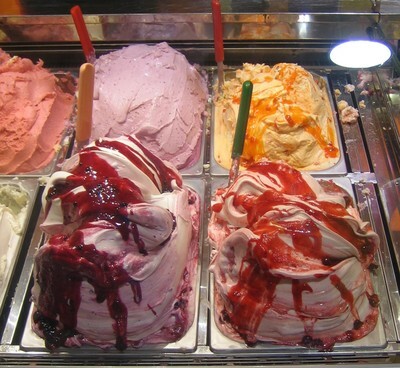 Especially in summer, when we eat more ice-cream than usual, there's no excuse for choosing lesser options. Spending your money at places like 7-11 and service stations, no matter how sweet or cheap the ice-cream there is, sends a message that Melbournians don't care about quality ice-cream. Unless you really can't afford it, send your business to places like Jock's Ice Cream - they deserve it. Why? For artisan-quality ice cream. When: Midday to afternoon, every day. Cost: Five dollars for two scoops.